Malmo Opera Orchestra; Arvo Volmer (conductor). Celebratory cantatas have been written for centuries. The events celebrated can range from large one such as the Congress of Vienna (Beethoven) or smaller events such as the inauguration of a statue (D'Indy, Taneyev). The practice of writing these pieces is almost universal, but perhaps nowhere more so than in the Scandinavian countries; witness the twelve composed by Carl Nielsen. Hugo Alfvén, Nielsen’s Swedish contemporary, contributed ten works to the cantata genre. While the fees paid for these works were definitely an incentive for their creation, Alfven also put a lot of care into these works and most contain a good deal of music worthy of him. Such concerns are not really relevant in the case of the Revelation Cantata as the usual cantata-style text is replaced by a judicious sampling of texts from the Bible and because the composer, though not religious, was sufficiently inspired by the pictorial aspects of the occasion of composition to produce one of his finest works. The Revelation Cantata was written for the consecration of the Church of the Revelation in Saltsjobaden, near Stockholm. The text was chosen by Nathan Söderblom, from the Bible to contrast the uncertainties of earthly life with the certainties of Heaven. Alfvén was prompted by this duality to group his forces antiphonally with full chorus and organ in the organ loft or otherwise in plain view for the earthly texts and the semi chorus (three sopranos, three altos, and three tenors) and instrumental ensemble out of sight for the heavenly texts. The cantata comprises a Prelude for organ and three movements for the full forces. The three-part Prelude elaborates on the duality between heaven and earth through varied treatment of the chorale Gud trefaldig, statt os bi (God in Three Persons, Be Our Savior) before the full chorus enters with a passage from Ecclesiastes, set homophonically, describing man’s lot on earth. This is a truly beautiful moment and is followed by several exchanges between bass solo and chorus, with the organ accompanying continuing with further texts from Ecclesiastes. The semi-chorus and ensemble (string quartet, harp, harmonium, and celesta) enter with the heavenly reply (from Psalm 19). Alfvén’s “celestial music” is not at all of the “Music Box Angel” variety but vigorous and fresh and the harp and celesta are used in a quite original manner. The bass continues with “O God, my soul is cast down within me…” (Psalm 42) but the semi-chorus counters with the familiar “Comfort ye…” (from Isaiah) and all join in a jubilant chorus to end the section. Movement 2 begins with the voice of God reproaching Man for his ingratitude, a passage impressive for its starkness. God is here effectively represented by three voices and harmonium. The full chorus asks forgiveness (Psalm 51) in a soft passage that is perhaps the highlight of the work. The earthly and heavenly voices join in another jubilant finale. The baritone solo that begins the final movement represents Christ proclaiming that those who follow him shall be loved by God, and the chorus answers with a quote from St. Paul that man shall live and die in the Lord, followed by a soft final ensemble praising the Lord with three Amens. Regardless of his own religious feelings, Alfvén here created a truly moving work, perhaps his best for chorus. 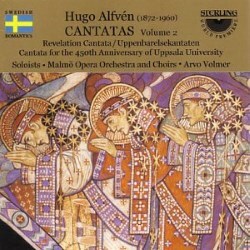 For many years Alfvén was the Director of Music at the University of Uppsala and it was natural that when the University celebrated its four hundred and fiftieth anniversary the required cantata would be written by Alfvén. The text by Gunnar Mascoll Silfverstolpe is no worse than the average cantata text but this did not stop Alfvén from creating a work that is quite stirring as well as containing some interesting experiments with timbre. The piece is in two parts (three and two movements respectively) and begins with the chorus singing an evocation of long-gone Uppsala students. For these sentiments Alfvén uses a descending motif to evoke Uppsala’s tolling bells, scored with heavy percussion and four pianos. This first movement alternates hymn-like and contrapuntal elements, adding to the bell-like effect. In contrast, the second section, describing the life of the students after graduation, is a baritone solo that is tightly-written and austere compared with the opening section. The third movement evokes the centrality of Lutheranism in the University’s identity. Here Alfvén introduces a new theme, a repeated “D”, to symbolize Alma Mater, followed by a soft passage for female voices and winds that is the highlight of the piece before the Alma Mater theme returns in grand fashion. Part 2 of the cantata begins with a soprano solo with a pastoral feeling, perhaps indicative of the start of the academic year in the fall. A new bell-motif, this time ascending, starts off the final movement, this scored with even more percussion than in the cantata’s opening. After this almost too weighty introduction the music settles into a chorale-like passage evoking the virtues of knowledge before the descending bell-motif returns along with the Alma Mater theme. Each of the works on this disc was recorded in a church in Malmö, the St. Petri Church and the St. Johannes Church respectively. The acoustic in the St. Petri Church is excellent-the chorus lines are completely clear and the instrumental ensemble comes through well, except perhaps the harmonium. In the St. Johannes Church the sound of the chorus is still clear but the orchestra sounds shrill, when the brass is not overwhelming the other instruments. Of the soloists, Frederik Zetterström is the standout, singing each of his very different roles with great conviction. Charlotta Larsson is more than competent with her solo in the Uppsala University Cantata, but Peter Boman is rather strident and stiff in the first movement of the Revelation Cantata. The Malmö Opera choruses are near-perfect. They have a beautifully clear sound and good enunciation, but also plenty of power. The Malmö Opera Orchestra also acquits itself well as do the individual instrumentalists in the Revelation Cantata. This is not to leave out Arvo Volmer, who leads his forces through all the various emotional contrasts of the Revelation Cantata while supplying the appropriate ceremonial heft for the Uppsala University Cantata. This disc originally appeared in 2003, but is reappearing as part of the reissue of the Sterling label by Nimbus, as is Volume 1 of the Cantatas. Highly recommended for all lovers of Scandinavian music or Romantic choral music in general.